While we may be known for the coastal and nautical, Hampton Roads has a wealth of farming history all because those early colonists had to eat and to trade! The 1780's Farm at the Yorktown Victory Center is the source of our homegrown wedding inspiration today! And if you're in town, it's a neat little place to visit in Yorktown as it shows what lower- to middle-class farm life in southeastern Virginia was all about. Tobacco definitely reigned as king of the cash crops! 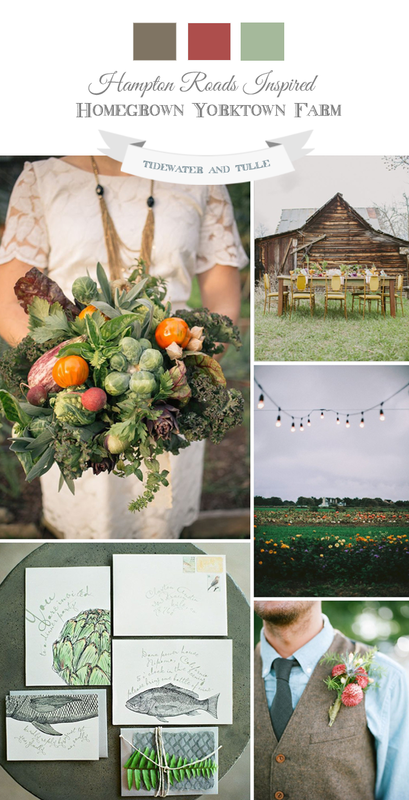 With the popularity of farm-to-table philosophies, this rustic wedding pulls its theme from the crops and the natural and local resources. Fruit wedding favors, hand-sketched stationery, homespun cotton groom's vest, and a lush all-vegetable wedding bouquet make this one green kind of celebration!